A CHRISTMAS gift with a difference has funded a generous donation to York Against Cancer. 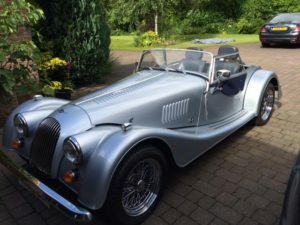 A businessman, who has asked not to be named, has sold his classic Morgan V8 sports car to donate £25,000 proceeds plus Gift Aid to the city charity. The car had been given to him as a Christmas present by the late York farmer and motor rally driver David ‘Piggy’ Thompson to thank him for advice he gave him some 20 years ago. David Thompson, father of World Touring Cars star and former British Touring Cars champion James Thompson, was a major motor enthusiast and following the advice, David asked the businessman what sort of car he really liked. He told David that the only car he had ever really wanted was a Morgan V8. “That Christmas Eve, there was a brand new Morgan sitting on my drive!”, he said. David sadly died in the years after he made his generous gift, and recently the businessman began to think it was time to do something with the Morgan as he no longer used it very much. Another friend was keen to buy the car and agreed to pay the highest price they could find for a similar vehicle on the internet – with York Against Cancer receiving the £25,000 proceeds plus Gift Aid. The money will launch York Against Cancer’s 30th anniversary appeal to keep its new mobile chemotherapy unit on the road when it comes into service in the summer. The businessman has long supported York Against Cancer and David’s widow said that David would have been delighted to see the cash support the mobile unit since he had had to travel to Leeds for treatment during his illness. In the On Again, Off Again Battle – Morgans Are Legal Again – In Australia!! It has not been possible to take delivery of a new Morgan sports car in Australia throughout much of 2016, due to the impact of revised Australian Design Rules. The 2016 MOGSouth Holiday Party was great fun! The weather on Friday and Saturday was typical North Carolinian Mountain weather, cool and crisp. Andrea and I, and Ian and Barbara Shelmerdine, traveled, albeit by air, up from Orlando for the party. The weather was certainly a change for us, coming from the 80s of Florida. We were usually cold the entire weekend but it was good. We did get a little rain late Saturday night and Sunday, but by then it didn’t matter, the party was over. Gene Spainhour and Pat Harris were our hosts and they did a great job managing this new location for us and making the MOGSouth Holiday Party one to remember. The Monte Vista Hotel in Black Mountain, NC was a wonderful location for the Party. Again, nearby Asheville NC, Black Mountain was a very quaint town tucked into the North Carolina Mountains. It was great to see everyone and reconnect! And, it wasn’t just about the old friends. There were a good number of new members at the Party, 6 new couples I believe. It’s good that MOGSouth is growing and evolving. We are ceratainly challenged by the expanse of our region, but nobody can deny that MOGSouth is a tremendous group of great folks that enjoy the cars but, in many cases, may enjoy the comraderie and socializing just a bit more. The town’s imaginative Christmas Parade was scheduled for Saturday afternoon, and luckily for us, ti passed right in front of the Hotel. We were are all on the street out front of the hotel or on the Hotel’s porch, watching the Boy Scouts, Girl Scouts, Dog Clubs, and all sorts of other town entities parade by, decked out with Christmas lights, decorations and playing Christmas Carols. Most were throwing candy and beads for the kids which kept the bunch in front of us hopping to get their fill. Quite interesting and quite fun. After the parade the MOGSouth group congregated on the Hospitality Suite for a little libation prior to dinner. A quick clean up and then we were off the Holiday Party’s main banquet. Given the size of the MOGSouth group, well over 60 folks, the hotel had converted their entire restaurant to a banquet hall for just us. I was somewhat surprised that the other guests in the hotel as well as other Restaurant patrons were seated in alcoves off the lobby. The Holiday meal, either chicken or salmon, was very well prepared and kudos to the chef for feeding 60 folks at one time, and not relying on a buffet. Well done! After dinner a few remarks. The Mother Courage Award was presented to Judy and Pat Buckley. Well-deserved and hard to argue with their contagious enthusiasm. Then off to the Hospitality Suite for dessert. Very nice. Andrea and I, and Ian and Barbara Shelmerdine, had the opportunity to use Sunday to visit the Grove Park Inn and see the holiday Ginger Bread House competition. The imagination and the skills of those creating these whimsical moments of ginger bread and candy is beyond belief. We found lunch at the Inn and visited their Antique Car Museum. A small museum, only 20 cars, but a nice representation of motoring through the 40s. Several Cadillacs. It turned out that the entire collection was the property of the original Asheville Cadillac dealer and many of the cars came on trade into the dealership. The only British car was an MG TD. We relocated to a hotel near the Asheville Airport to position ourselves for an early morning flight out of Asheville back to Sanford Florida. All in all, another great Holiday Party!! Extremely well done, Gene and Pat!! A great Holiday Party!! Thank you.